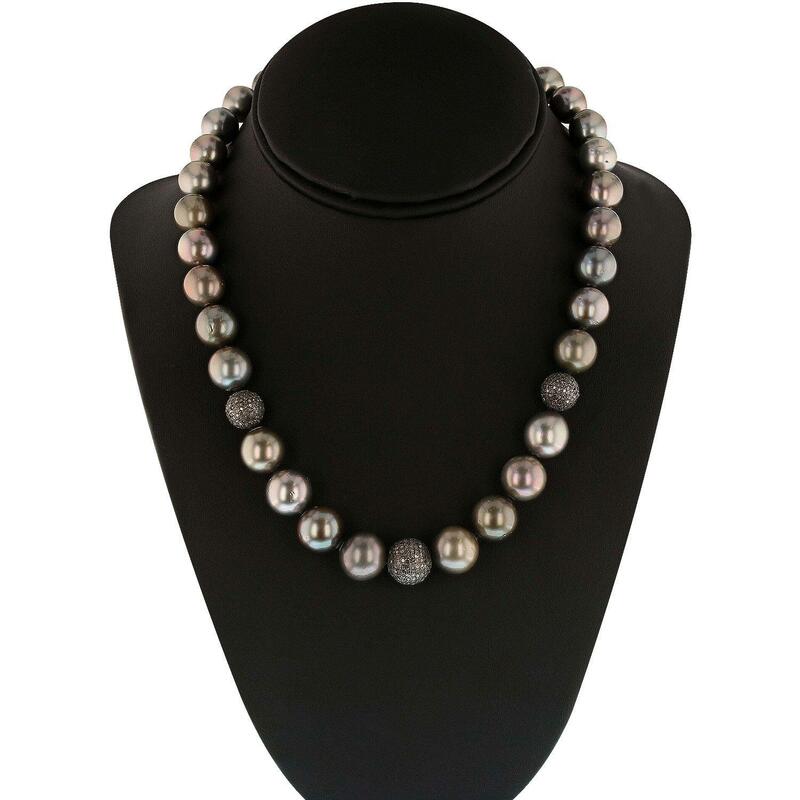 One graduated single strand pearl and anodized silver diamond set bead station necklace 17.5" princess length, knotted with a silver 11.0mm lattice ball clasp containing 32 Tahitian cultured pearls, 10.5mm in size to 13.0mm in size. The pearls are silver in color with a very good luster, near round and lightly blemished. Graded in the strand. Tahitian cultured pearls form in the large "Black Lipped" Pinctada Margaritifera oyster, which is about twice the size of the Japanese Akoya oyster. This warm water species from across the central and South Pacific Ocean is at home in the bays and lagoons of the islands & atolls of French Polynesia. Tahitian cultured pearl farmers generally raise their oysters in lagoons. Tahitian cultured pearls take from two to four years to form. Black pearls are known for their iridescent, vibrant, almost metallic natural colors, unique among saltwater cultured pearls. Though commonly called "Tahitian" pearls, they are actually gray, to a lighter or darker degree. Tahitian pearls have the unique ability to display a variety of colors at the same time, which can be seen glistening on their surface. Six Hundred Thirty-Two bead set single cut diamonds, measuring 1.10 - 0.80 x 0.57mm (depth est ) approximate total weight of 632 Stones = 2.00ct. Graded in the setting.